Bookends: Of Fire and Roses by Danielle Belwater ~ Review! Of Fire and Roses by Danielle Belwater ~ Review! Dreams of his own death plague his sleep as old dark magic, hidden for centuries, resurfaces and has its sights clearly set on Nate. Of Fire and Roses is a Teen/ Young Adult Supernatural Romance about a teenage boy named Nate West. Nate's mother is recently deceased and he and his father's relationship is pretty much non existent. When Nates father takes a new job, Nate is forced to relocate to a new home 9 hours away. There he meets Josh who he instantly befriends and Cora who he instantly falls in love with. Long ago a curse was placed on Cora's family and Nate is plunged head first into a world full of the supernatural. Full of phenomena that he barely believes in much less knows how to deal with. I have mixed feelings about this book. First let me tell you what I DID like about it and then I'll tell you what I DIDN"T.
1. 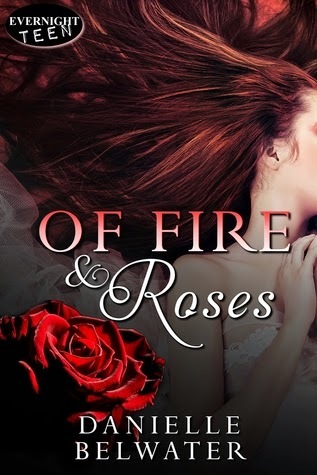 Of Fire and Roses was well written as far as the writing style and the amount of detail provided by the author. I liked that as a reader I never felt like I was being left in the dark. 2. The characters were well developed and thought out. I didn't just know what each character or their life was like now, I also got a brief history on just about each character in the book. This is so important and almost never done. It helps so much when it comes to readers connecting to and relating to CHARACTERS in the story. 3. The ending was pretty great. The story seemed to get better and better the farther you got into the book. Despite my 3.5 star rating, once you got towards the middle of the book and on it was pretty hard to put down. Basically it was only that things just seemed to happen very quickly in Of Fire and Roses. Too quickly for me. I didn't feel like there was enough build up. Nate catches a glimpse of Cora one day while running in the woods. By the time he catches up to her, he's in love. By the next day they are in a full blown romantic relationship. (Not sexual, just romantic) Too much, too soon. Cora tells Nate about her family's curse right away, even though he is little more than a stranger, and falls in love with him with little to no hesitation on her part, even though she knows there will be repercussions. And even after Nate finds out about the curse, which he claims to not believe in, he sticks around which doesn't seem to be typical teenage boy behavior to me. I wouldn't have walked in the other direction, I would have run. But that's just me, not Nate. His heart wants what his heart wants. The swiftness of it all just made the STORY hard for me to connect to. In the end, I would like to point out that this book has gotten glowing reviews. Just because it wasn't for me doesn't mean that it won't be for you. This just one opinion out of many. I definitely think that if the synopsis grabs you, you should buy the book and form your own opinion.